Delaware City Schools Superintendent Paul Craft shows a map of all the school districts in Delaware County during the State of Schools event held at SourcePoint on Sept. 27. Delaware County’s five superintendents spoke about the “State of the Schools” during the Delaware Area Chamber of Commerce’s Third Thursday event at SourcePoint on Thursday, Sept. 27. The event’s timing was particularly good, since the State of Ohio had issued its “School Report Cards” the week before, for the first time giving an overall grade. And for its next biennial budget, the state legislature has an opportunity to establish full funding per pupil that has penalized some of the growing districts. This would not only help students, it would ease the burden for taxpayers. Paul Craft, superintendent of Delaware City Schools, said the county’s school districts have grown in enrollment 31 percent in the past decade, making Delaware the highest growth county in the state by enrollment. In comparison, Franklin and Warren counties experienced slight growths, while the rest of the Ohio’s counties had declines. He said Delaware County had an average on-time graduation rate of 96 percent, while the state’s was 84 percent. “There are a bunch of measures by which you can say Delaware County is the number one county in K-12 education out of the 88 counties in the State of Ohio,” Craft said. He said all six of the county’s high schools have been ranked in the top 10 percent in the nation by U.S. News & World Report. The county’s seventh high school — Berlin — just opened its doors this school year. Speaking of Delaware City Schools, Craft said the district has an enrollment of about 5,800, and will add 70-85 students a year over the next decade. Although the district received an overall C grade, he said DCS achieved a value-added progress grade of an A for the eighth year in a row. “Our teachers are moving kids, which is what you ask of them,” he said. Craft said the district may be on the ballot next May, but no tax increase would be involved. Angie Pollock, superintendent of Big Walnut Local Schools, discussed the district’s 2020 vision to personalize instruction, engage students and grow minds. The district received an overall B grade on the state report card. “We decided five years ago that we wanted focus to on what we wanted in our classrooms and not on the state report card, the idea that these are research-based best practices for kids, and let the report card take care of itself,” Pollock said. BW’s enrollment is just over 3,800, over a thousand more students in the last decade, and 180 new students this year. To meet the growth, voters narrowly approved a bond package. The district will be breaking ground on a new elementary school in the spring, Pollock said. A new high school will also be built on the 103-acre site. Pollock also discussed funding challenges for Big Walnut. The state share of funding has decreased, and since there isn’t a lot of commercial or industrial base in the district, the brunt of funding is on the homeowners. “We will most likely be back on the ballot in 2020 as our current operating levy will be up,” Pollock said. 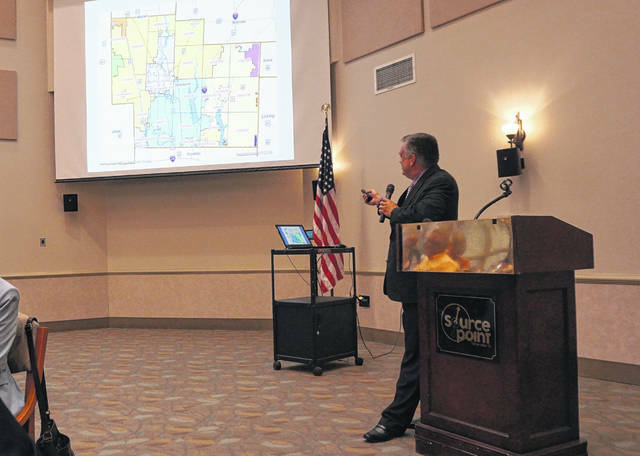 Andy Miller, superintendent of Buckeye Valley Local Schools, said there are 2,300 kids in the district, which covers 206 square miles and extends into four counties. He said the last time they received new operating dollars was in 1992, yet student achievement is improving yearly. Also, the district has more devices than students, and work on East and West elementary schools is continuing. “If they rated school districts like they do colleges, we’d be a central Ohio best buy,” Miller said. BV received a B overall grade on the state report card, but in terms of value-added progress, the district received an overall A grade. “Every school year brings crazy things, whether it be from the state or a disruption with local things, but our core business is growing kids, and we’re doing an awesome job of that,” Miller said. Mary Beth Freeman, superintendent of the Delaware Area Career Center, said enrollment is around 1,500. DACC’s student population is comprised of 24 percent Olentangy; 20 Westerville; 17 Delaware; 9 Buckeye Valley; 7 Big Walnut; and 8 other. She said the greatest interest is in information technology, health and engineering programs. As for the new campus being built on U.S. Route 23, Freeman said construction should be completed in the spring and open for the 2019-20 school year. The north campus will be will turned over to Delaware County, she said. Mark Raiff, superintendent of Olentangy Local Schools, said the district has an enrollment of over 21,000 and employs more than 2,500 people. The district received a B grade overall, but Raiff said he wants to achieve all “A”s across the board. Raiff also mentioned the opening of OLSD’s fourth high school, Berlin, which currently has grades 9-11, and its first senior class in 2020. In addition, Olentangy is planning to add to three of its elementary schools to address capacity issues. 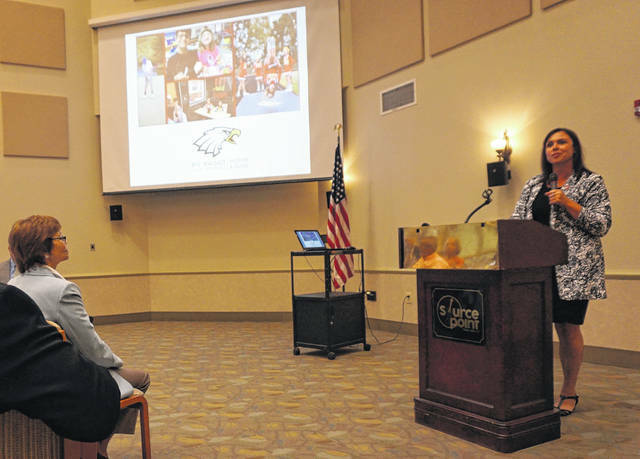 In her introductory comments, Chamber President Holly Quaine said the five districts combined employed about 4,000 people, making it one of the county’s largest employers and having a huge economic impact. The annual event was sponsored by the Delaware County Foundation. Marlene Casini, president & CEO of the Foundation, said the Big Walnut Middle School Leadership Council would be among the award recipients at its “Evening of Generosity” in Westerville on Oct. 25.